The Gibson Company pioneered new designs in acoustic mandolins, and also built one of the earliest and most successful mass-produced electric mandolins: the EM-150. Introduced in 1936, this hollowbody, 8-string instrument at first featured the same "Charlie Christian" pickup used on some of Gibson's archtop guitars, with a notch cut in the pickguard to accommodate the pickup. See the top photo for an example. EM-150s built between 1941 and 1949 have a rectangular screw-pole pickup; post-1949 instruments have a "soapbar" pickup similar to the P-90 used on the Les Paul guitar. (Correct me if I'm wrong, but I believe these pickups are not identical to P-90s in that they have only four poles as opposed to six.) Gibson discontinued the EM-150 in 1971. The instrument's simple design—a standard A-style mandolin with a few extra holes for pickup, jack, and volume and tone knobs—is probably still the most common configuration for electric mandolins, and has been copied ad nauseam by low-end manufacturers of every stripe. Used ones range from $750 to about $1500; the older Charlie Christians are more desirable and therefore more expensive. Zoom in on this puppy and you'll see its distinctive pickup: it resembles the Charlie Christian, except that the ends are rounded. This is an EM-100; they were introduced in 1938, renamed EM-125 in 1941, and discontinued after 1943. Meanwhile the EM-150s started sporting P-90 pickups. It's often mistakenly called the EM-250, but EM-200 is the correct model number. Also known as the "Electric Florentine," this mandolin is much harder to find than its acoustic/electric cousin. It's probably the first 8-string solidbody ever produced, definitely one of the best looking, and certainly the best known. Like the later EM-150s, it featured a sawed-off P-90 pickup. It was available in sunburst and, I think, red finishes as well as black. Jeff Bird of the Cowboy Junkies uses an EM-200; Nash the Slash once played one, but no longer does. 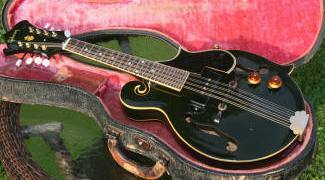 The most famous EM-200 owner I can think of is rockabilly/swing guitarist Brian Setzer, but he no longer owns his—Mandolin Bros. sold it a few years back. 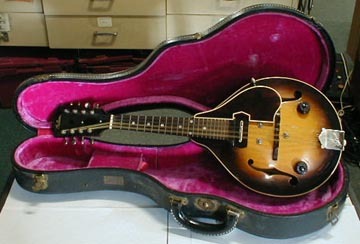 Gibson produced the EM-200 between 1954 and 1971. (A couple of early examples—presumably prototypes built for guitar shows—were labeled EM-150; Gibson apparently later decided to continue the acoustic/electric EM-150s and give the Florentine its own model number.) They usually range from $1500 to $2500. One mandolin neck, one tenor guitar neck. A rare cousin of the EMS-1235 (see below). Another mando/tenor combination, from 1966. Half mandolin, half guitar. Gibson made these from the late '50s till 1961. Semi-hollow design with a spruce top. Just when I thought I'd seen it all, along come a pair of Gibson electric mandolas sporting Charlie Christian pickups. The H-5 model on the left was custom-built in the 1930s for Dave Apollon. The one on the right is a 1938 H-1E. This is another doubleneck; one neck is a short-scale bass, and the other is an 8-string mandolin with a P-90. There's only one, and it belonged to the late Govt. Mule member Allen Woody. On July 2, 1937, Gibson shipped its first electric mandocello (it was, however, not the world's first; that distinction probably goes to ViVitone). 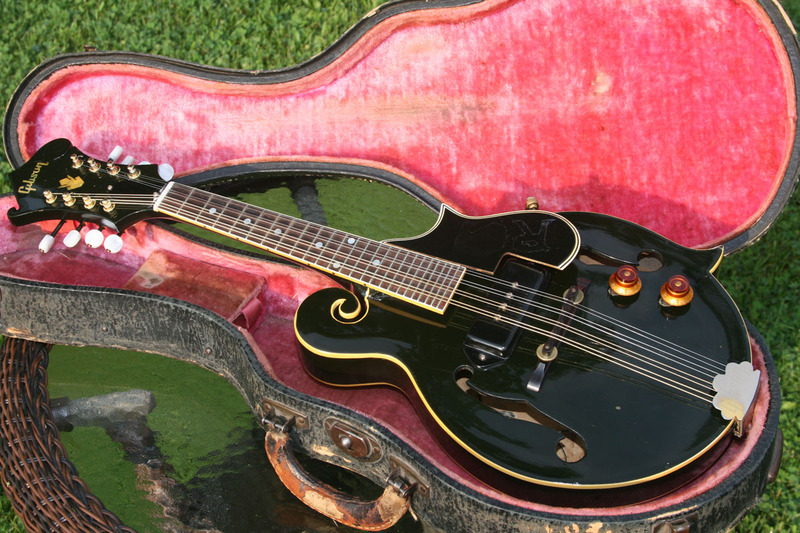 This sleek black beauty would have been a custom order back in '54, when Gibson was making very few F-style mandolins. It sports a P-90 pickup and, at least in my humble opinion, is quite a looker, despite lacking the original tuners and bridge. 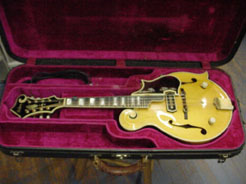 Of course, 1954 was also the year when Gibson introduced the EM-200, perhaps in response to the occasional demand for instruments like this one. If an F-12E wasn't fancy enough, you could always get one of these. Wow! A custom 1930s blond F5 with a Charlie Christian pickup. I can hardly believe my eyes. At least two of these exist. Gibson displayed this 4-string beauty at the January 2008 NAMM show. Appears to have been a custom shop one-off. A pair of custom-shop creations from the January 2019 NAMM show.